Q Who is Highgrove Bathrooms? Highgrove Bathrooms is an Australian, family-owned and operated business, with multiple business partners throughout our stores in Australia. We opened the doors to our first store in 2004, now with over 30 stores and continuing to grow we are Australia's fastest growing bathroom company. By closely following the local and international markets, our vast knowledge of the Australian bathroom industry is second to none. Contact us if you are interested in a business venture with Highgrove Bathrooms. Q Do you have retail stores or are you just online? We currently have over 30 stores spanning over QLD, NSW, VIC, SA and ACT. Find your local store. Q Can I buy online? At this stage in time, you can’t purchase online however you can place an order. To add items to your order, go to the page of your selected item and click ADD TO CART. If you would like to adjust the quantity, you can select the Qty: - or + until you find your required quantity, then click ADD TO CART. Once you have finished your selection and are ready to place your order. Proceed to the checkout. Which can be found in one of two places. Q Can I modify an order? Yes. There are multiple ways to Edit Your Cart from start to finish of your online ordering process. 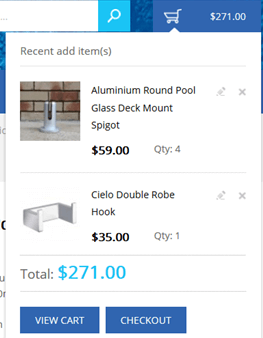 You can increase, decrease, add or remove items at any stage of your ordering process until you PLACE ORDER. If you need to make an amendment after you have placed an order, you can CONTACT US via our website or email helpdesk@highgrovebathrooms.com. Alternatively, a sales representative will be contacting you to go through your order. This would be a good time to go through any modifications. Modifications can be made to your order prior to payment and dispatch. Q Can I place an order if an item is out of stock? Yes. There may be items that your local store does not have in stock at the time of your order. A sales representative will be in contact to discuss your order and give you an ETA on your items availability. Q Am I able to cancel an order? Yes you may cancel an order without charge prior to payment and dispatch. To cancel your order please email, helpdesk@highgrovebathrooms.com. To create an account, click Register in the top right hand corner of the website. Fill out your Name, Email Address and Password. You may opt to Sign Up for Newsletter at the same time. Then Press SUBMIT to confirm your account. To reset your password simply go to the My Account Page and click Forgot Your Password? This will then ask you to enter your email address. Fill out your email address and click SUBMIT. This will then send an email with a link to reset your password. You must follow the prompts and enter a new password. Q How do I change my account details? To change your account details, simply log into your account, change the information as you require and save. If you have placed an order, please advise the place of purchase in your change in details. Q When can I pick up my product after ordering? A representative from Highgrove Bathrooms will call you to go through your order with you and give you information as to when it will be ready for pick up or dispatch. Q Can I sign up for your newsletter? Yes, to sign up to our newsletter simple click on Newsletter Sign Up in our menu and fill in your details as required. Alternatively you can Register and tick Sign Up for Newsletter. Q Is my product in stock? While we have a large majority of items in stock, there is a chance that your item may not be available immediately in the store. You may enquire about the availability of an item by contacting your local store. If you have ordered the product and it is out of stock, a representative will contact you to let you know the status and to give you an estimate on when the product is likely to be available to you. Q Do your products come with warranties? Yes. Our warranties cover up to 7 years on selected items. If you are interested in the specific warranty of a product, you can view the warranties in the products information. An overall view of our warranties across our range is available here. Q How do I process a warranty claim? To process a warranty claim you will need to fill out our Warranty Request Form and return to your place of purchase. Your place of purchase is on your tax invoice. In order to help your claim images are advised. If you do not know your place of purchase, you may email helpdesk@highgrovebathrooms.com. Q What do I do if I have received the wrong product? If you have received a different product to the item you have ordered, please contact your place of purchase. This will be on your tax invoice. We will organise for the correct item to get to you as soon as possible. If you do not know your place of purchase, you may email helpdesk@highgrovebathrooms.com. Q How do I return or exchange my order? It is best to contact your place of purchase, found on your tax invoice. If you are returning a product due to faulty, incorrect or warranty purposes, you may be asked to fill out a warranty/returns request form dependant on the problem. Highgrove Bathrooms do not refund for change of mind, we can accept returns for product exchange or store credit however the cost of returning the item is down to the customer in this instance. If you do not know your place of purchase, you may email helpdesk@highgrovebathrooms.com. Q What is your Returns Policy? If you are returning a product due to faulty, incorrect or warranty purposes, you may be asked to fill out a warranty/returns request form dependent on the problem. For our warranty request form, please click here. Highgrove Bathrooms do not refund for change of mind, we can accept returns for product exchange or store credit however the cost of returning the item is down to the customer in this instance. It is best to contact your place of purchase, found on your tax invoice. If you do not know your place of purchase, you may email helpdesk@highgrovebathrooms.com. Q Can I return and item due to change of mind? You may return for change of mind however cost of returning the item is down to the customer. We do not refund for returns due to change of mind. A store credit or product exchange is available in this instance. Q Can I return an item that doesn't fit? You may return for change of size however cost of returning the item is down to the customer. We do not refund for returns due to change of size. A store credit or product exchange is available in this instance. Yes. Our aim is to make our products accessible throughout Australia. Q Can I collect my item from a store? Absolutely! Please wait for your order to process before collecting from a store. We will contact you when your item is ready for collection. Q How much do you charge for delivery? Delivery charges will vary based on product and your location. When placing your order, select the delivery option. Our friendly sales staff will be contacting you to go through your order and the cost of delivery. Q How will I know that my item has been dispatched? You will receive email confirmation with your dispatch information. This will have the dispatch and delivery information on it. Q I have received a product that has broken in transit. What do I do? Following acceptance of a delivery, please check all items for breakages within 24 hours. If you notice that the product is broken please take a photo of the package and follow the Warranty and Returns procedure. Should an item be obviously broken on arrival, do not accept the delivery. Due to the nature of the materials used in a bathroom, if you notice the product is damaged before opening, please leave the package sealed. Q Do you deliver overseas? At this current time, we deliver within Australia only. Q How long does delivery take? We aim for goods to be delivered within 3 - 7 days from dispatch. This will be totally dependent on your location. When you are contacted by Highgrove Bathrooms, we will let you know when the item is going to be dispatched and when it is due for delivery. Q Is my information being kept safe? The privacy of our customer's information is paramount. We have policies, procedures and a very secure website to ensure your personal information is handled with due diligence under the National Privacy Principles of Australia.